Maritime Exercise “AMAN 19” continue the 2nd day, here on Saturday. related collaborations and maritime security dynamics were discussed. efforts for peace and security. Security Patrol and regular bilateral/ multilateral engagements with other countries. efforts and focused commitments in support of collaborative maritime security in the region and conduct of the Exercise. called on Vice Chief of Naval Staff, Vice Admiral Kaleem Shaukat. laid wreath at Shuhada Monument at PN Dockyard to pay homage for their sacrifices. 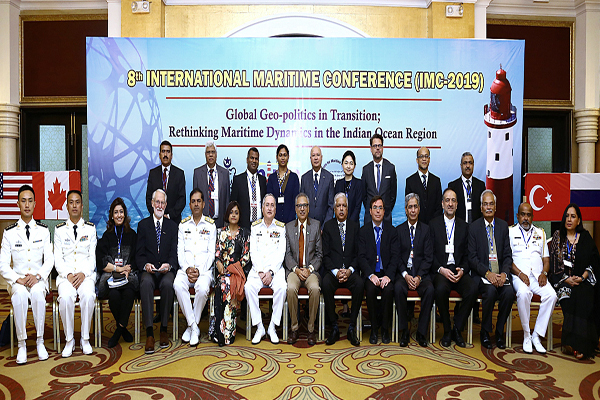 Dynamics in the Indian Ocean Region’ under the auspices of National Institute of Maritime Affairs also commenced today. countries and Pakistan Navy were also organized which included cricket, basketball and shooting. Maritime Counter Terrorism Demonstration here at PNS QASIM Manora. Governor Sindh Imran Ismail graced the occasion as chief guest. and specialized skills by Special Operations Forces of Pakistan Navy to counter acts of maritime terrorism, refine special operating procedures, exchange of professional expertise and to enhance interoperability with participating SOF teams. capabilities included Dolphin Maneuvers by Special Fast Boats (SFBs), Fast Boat Recovery, Advance Fire Arms Drills, Static Line Para Jumps, Clearance Ops, Insertion of SOF Teams & Marines Platoon to Hover Craft, Bomb Burst by Helos and Free Fall Jumps etc. countries through cultural heritage as well. Pakistan Air Force and Pakistan Rangers played a mix of their traditional and military tunes. The enchanting melodies mesmerized the audience and were really appreciated. witnessed the Counter terrorism demonstration and Bands display.